Standing outside the Ryman Auditorium, one is first struck by the enormity of the building’s windows and doors. It stands looking over the city bustle of Fifth Avenue. Thomas Ryman, a riverboat businessman, knew the river port city of Nashville well. During his career in the late 19th Century, it was filled with bars, brothels, and unruly people. As one such person seeking to cause some trouble, Ryman attended a tent revival in 1885 by Samuel Porter Jones, with the purpose of disrupting and heckling the sermon. He was instead was completely transformed by the service. 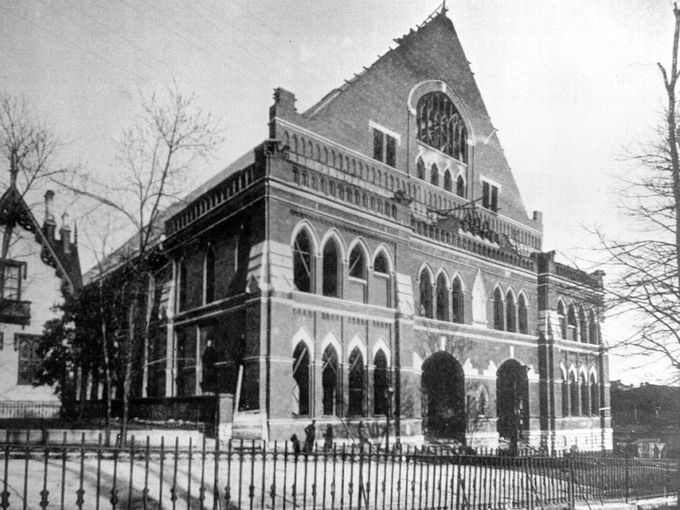 Following his conversion, Ryman building the Union Gospel Tabernacle in 1890 so that Jones would have a permanent place to preach. Having been so honored by the building, Jones, and an audience of 4,000 unanimously voted to rename the building the Ryman Auditorium. 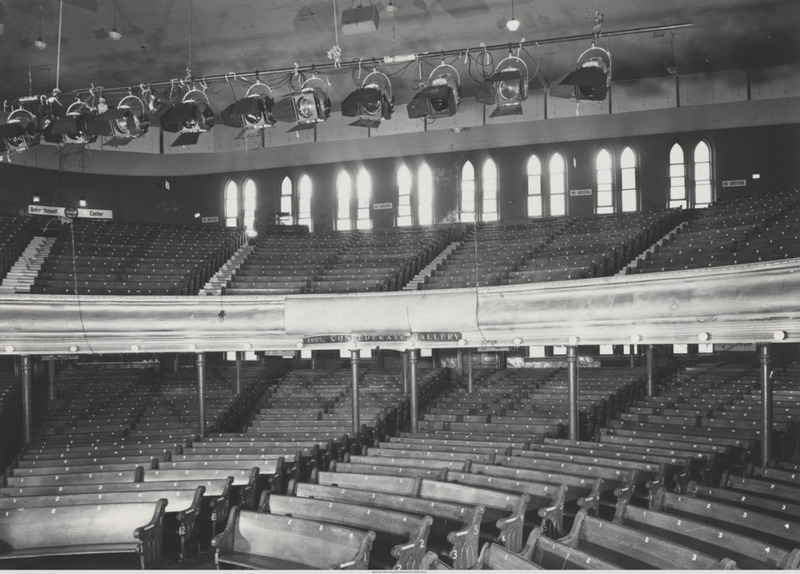 As interest in evangelicalism dwindled at the turn of the century, the Ryman became a prestigious stage for acts such as the Fisk Jubilee Singers, and graduation ceremonies for Vanderbilt University. On October 23rd, 1908, new manager Lula C. Naff built the first stage at the Ryman. Many prominent speakers took the stage through the 1910’s and 1920’s including Hellen Keller, the National Woman’s Suffrage Association Convention, and Charlie Chaplain, who performed there to sell Liberty War Bonds during World War I. On June 5th 1943, the famed country music radio show The Grand Ole Opry on WSM Radio moved from the War Memorial Auditorium to the Ryman Auditorium. 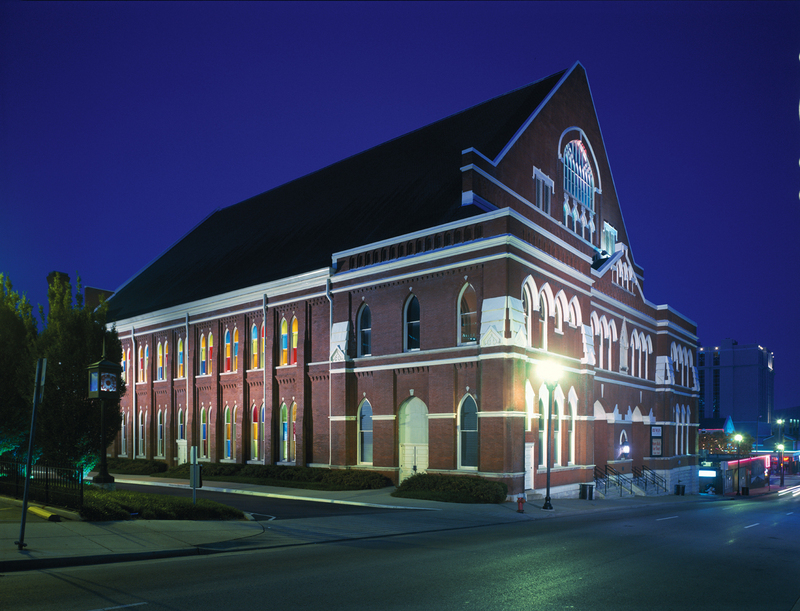 By hosting the Grand Ole Opry, the Ryman became known as the “Birthplace of Bluegrass,” by hosting pioneering bluegrass musicians Earl Scruggs, Lester Flatt, and Bill Monroe. While famous actors and actresses still occasionally graced the Ryman stage, the venue’s focus increasingly became music. Johnny Cash, Jim Reeves, Patsy Cline, and countless others all vied to be members of the famed Grand Ole Opry throughout the 1950’s and 1960’s. In 1969, the National Life Insurance Company, which owned the Ryman, announced it would be building a new Opry House. On March 15th 1974, Johnny Cash and June Carter Cash led the Ryman in a singing of “Will the Circle Be Unbroken,” in the last performance of The Grand Ole Opry at the Ryman. Opry mainstays such as Minnie Pearl openly wept. The Ryman fell into disrepair until 1994 when Emmylou Harris released an album from inside the auditorium. Its quality inspired efforts to repair the building, where it is known worldwide for artists of all genres to play. Tessa Antonelli, “The Mother Church of Country Music: The Ryman Auditorium,” Bygone Nashville, accessed April 25, 2019, https://bygone-nashville.mtsu.edu/items/show/14.